At PFG we supply products, services and innovative solutions to our customers who operate in the resource processing, mining, defence and civil engineering sectors. Our people are experts in their field, with years of practical industry experience combined with deep technical knowledge and a passion for the industries we work in. Our business is built on our strong knowledge of polymer technologies and its application to solve industrial problems for our customers. Our work includes custom design, fabrication, manufacture and installation of equipment and systems for a wide range of industrial applications including; water/liquids distribution equipment, tanks, pumps, filters, pipelines, fittings, chemical dosing systems, storage, handling and de-watering systems. Some examples of our industrial work include the design, supply and installation of HDPE of potable water and effluent tanks for one of Australia’s largest manufacturers of sea going passenger/vehicle ferries and military transports, the manufacture and installation of headers and manifolds for Lower South Esk (Milford Dam) Irrigation Scheme, and a double containment Chlorine gas dosing system for Taswater. We also work with various councils, TasGas, UTAS, local civil contractors. 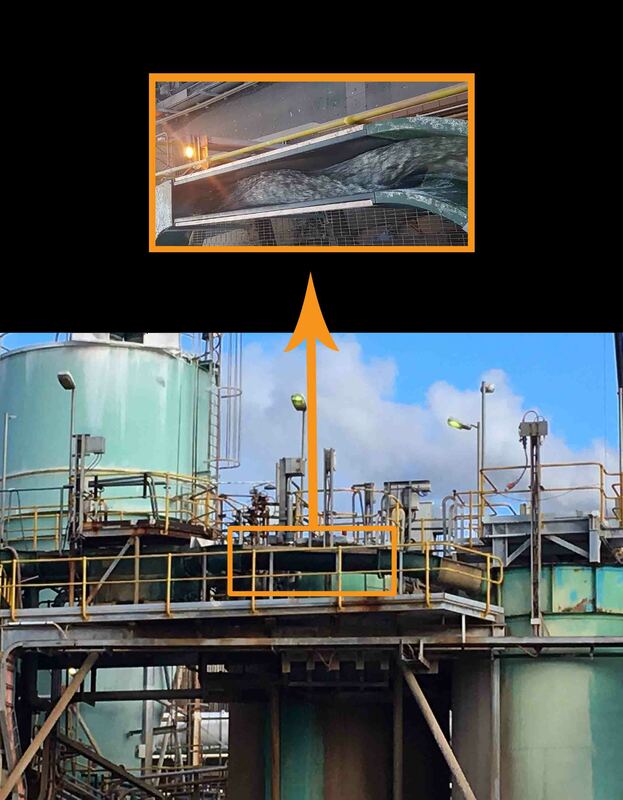 Change out of launder in HDPE launder at Nyrstar Risdon Smelter. Nyrstar’s Risdon electrolytic zinc smelter was built in 1901 but is still in the upper quartile of zinc smelters in the world. It represents 40% of Tasmania’s export value and employs around 700 people. Currently the plant is dogged by high sustainment costs due to old equipment, corrosion, and fatigue. PFG was engaged by Nyrstar to design and develop a new section of launder carrying effluent through the treatment plant adjacent to the plant outfall. This project had a high degree of difficulty due to the launder system being on an elevated structural steel framework almost directly over the Derwent River. The original section was manufactured from PE but after 27 years of service had failed along a joint. PFG selected PE100 high density polyethylene (HDPE) sheet from German firm Rochling as the main material and used extrusion welding with Leister weld guns to bond the CNC router cut flanges and mounting lugs. The top folds were drawn into shape using heated dies at PFG’s Hobart workshop, and the main shoe was rolled by another Nyrstar contractor Saunders and Ward at Kingston for PFG.